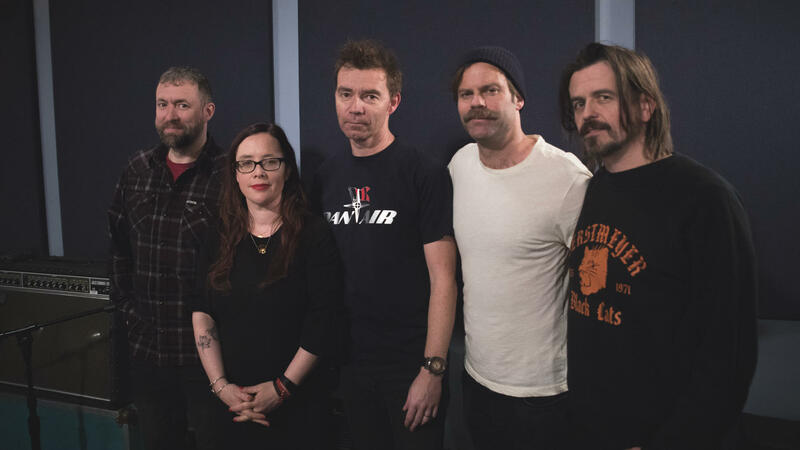 The reunion of the British shoegaze band Slowdive in 2014, along with their subsequent self-titled album last year, may not have had the pop culture impact that LCD Soundsystem coming out of retirement or the restart of the Pixies had. But what it did do is allow a new generation of shoegaze fans to hear the music from the band's 1989-95 heyday firsthand. Slowdive is Rachel Goswell on vocals and guitar, Simon Scott on drums, Neil Halstead on vocals and guitar, Nick Chaplin on bass and Christian Savill on guitar. Halstead, Goswell and Scott also formed the more acoustic band Mojave 3, which coexisted with Slowdive for a while. I am one of those second chance fans. I want to know how they came up with their sound, — layered guitars and submerged melodies — what childhood friends Halstead and Goswell were like as kids and how they felt about being labeled as shoegaze, which originally held negative connotations. I also find out why they got back together, but first, why they split 20 years ago in the first place! Hear it all in the player above.